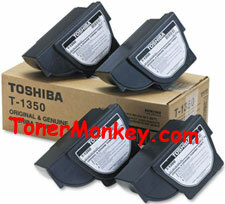 The Toshiba BD1340, Toshiba BD1350, Toshiba BD1360, Toshiba BD1370 Toshiba toner T-1350 listed on this page is genuine Toshiba brand not generic and not refilled unless it clearly posted "Generic" or "Rebuilt". The yield for Toshiba Toner is based on a 5% coverage of the printed page. Page Yield varies by the condition of your machine maintenance.